Rosa Parks took a stand by keeping her seat on the bus. When she was arrested for it, her supporters protested by refusing to ride. Soon a community of thousands was coming together to help one another get where they needed to go. Some started taxis, some rode bikes, but they all walked and walked. With dogged feet. With dog-tired feet. With boycott feet. With boycott blues. 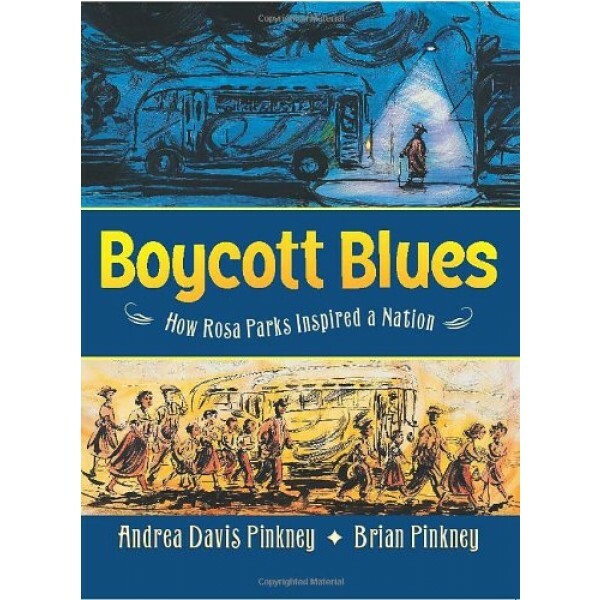 And, after 382 days of walking, they walked Jim Crow right out of town. . . .
"With glowing, dramatic double-page spreads and a clear rhythmic text, this large picture book tells the inspiring story of the Montgomery bus boycott. An adult who was there tells a child today how it was in language that has the beat of the blues—weary, sharp, and sweet. Dog tired, that’s me, says the narrator, who appears in most of the pictures as a dog strumming a guitar. 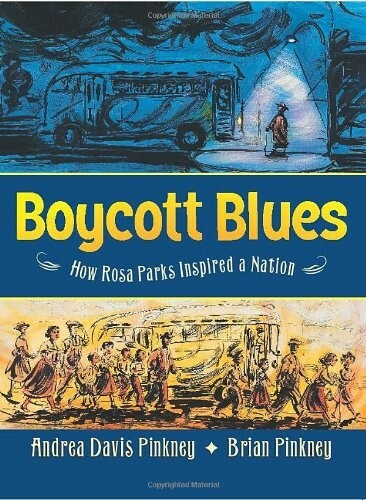 Beginning with Rosa Parks’ refusal to give up her seat on the bus to a white man, the story moves on through history to Martin Luther King Jr.’s inspiring speech calling for a boycott and the many people who join the movement and refuse to ride the buses.